Rising almost 150 feet above sea level, the Castillo de San Cristóbal (Saint Christopher's Castle) is a massive structure that occupies most of the northeast edge of Old San Juan. Built mainly over a 20-year period (1765-1785), San Cristóbal was over 200 years newer than Castillo San Felipe del Morro (more commonly called El Morro), Puerto Rico's military stalwart at the time. Yet it was a much-needed addition to the city's defenses. While El Morro guarded the bay, San Cristóbal watched over the land east of Old San Juan. Building a fortification that protected the city from a land invasion proved to be a wise move. In 1797, the fort helped repel an invasion by Sir Ralph Abercrombie. From an architectural perspective, both San Cristóbal and El Morro are castles, not forts, though they served an incredibly important military function. The design of San Cristóbal was ingenious, and followed a model known as "defense-in-depth." The castle is comprised of several layers, each walled and stoutly fortified to frustrate and slow an enemy not once, but several times. A walk through the fort today will show you its unusual but effective layout. The fort has seen its share of battles. It fired the first Spanish shot of the Spanish-American War. During World War II, the U.S. added fortifications to its outer walls. Through it all, it has stood the tests of time and war. However, in 1942, the U.S. added military bunkers and concrete pillboxes to the fort, which detract from the original structure, and unfortunately are still an eye store today. 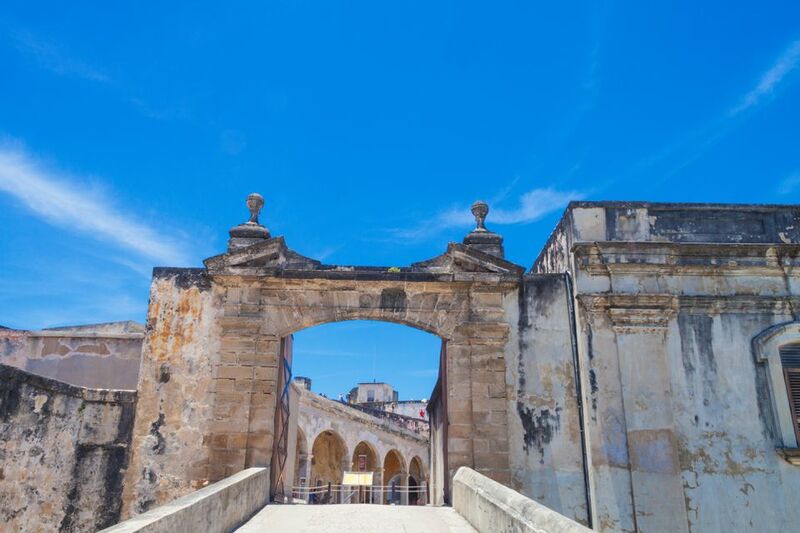 A visit to San Cristóbal affords you the opportunity to walk upon the parapet of you can gaze over the barrel of a cannon at cruise ships docking in the San Juan Bay, or at El Morro on the eastern edge of the old city. You can step inside a Garita, or sentry box, and look out over the water. And you can see Old San Juan spread out before you. The area combining El Morro and San Cristobal is known as the San Juan National Historic Site and is now operated by National Park Service. A budget-friendly attraction, admission to the site is just $5, according to the Park Service website, and you have the option of exploring the site yourself or going on a guided tour. If you choose the latter, which is a free service, you may have the opportunity to hold one of the bayonets in the soldier's barracks, take a tour of the tunnels below, or simply learn more about the history of the castle. The standard hours for the park are from 9 am to 6 pm daily and it is open to the public year-round, rain or shine. Depending on the severity of dangerous weather conditions, the park may shut down, so be sure to check the website for the most up to date information. Children of all ages are allowed, as long as they are accompanied by an adult. Pets are allowed on the grounds of San Juan National Historic Site, but not in the fortified areas.